It may be back-to-school season, but you won’t need any instruction on standing out from the pack. Take your A-game up a notch, whether you’re hitting the lockers or cubicles, with one of Crystalyn Kae’s capacious Troubadour totes, which we’re giving away in your choice of available solids, velvets, and tweeds. Punctuated by silver-toned hardware, each bag is handmade in Seattle from glazed cotton, which Kokorowski crinkles, stretches, and buffs to give it a supple, leather-like appearance. Plus, the Troubadour includes a padded divider—roomy enough for a 15-inch laptop, homework, and not-at-all-fake doctor’s notes. Enter now to win! 2. LEAVE A COMMENT and tell us which style of Crystalyn Kae bag you like best and why. Although it doesn’t hurt to get fancy, we’ll be picking a winner at random. We’ll announce the winner in our newsletter on Wednesday, September 7. The deadline to enter is 12 midnight ET on Tuesday, September 6, so ENTER NOW for a chance to win! Crystalyn Kae offers a unique range of versatile everyday handbags, great for work, play, and travel, since 2001. With an emphasis on texture, shape, and pattern, designer Crystalyn Kae Kokorowski’s handbags are distinctively stylish, durable, and functional. Each bag is sustainably created in Seattle using a mix of natural, reclaimed, and vegan-friendly materials. That champagne tweed number is adorable (#6)! That embodies everything I love about autumn: the excuse to dress like an Ivy Leaguer - tweed, scarves and lots of (faux) leather boots and bags! Don't hate me, because I can't wait for autumn! The Brown Tweed troubadour tote bag is my favorite. Would look just great to go to my new job ! I love it ! I like the "Burgundy Clutch"... I think it's bigger than it seems. It looks like a good purse to go out at night or go shopping: big space, small purse. I really like the Troubadour Tote because it fits me best - I like the big, lots of compartments-pockets purses and totes with sturdy handles. And it looks nice too. The tan Troubadour tote (#2). It's a perfectly gorgeous everyday tote, and as someone who lugs around a 15.4" MacBook, extra drives and iPad 2 everywhere, I love that you don't have to give up style for space. I love these bags. I'm in NYC so it's all about black although the wine color one is gorgeous too! I have a custom made troubadour tote for my macbook pro that I ordered from crystalyn kae about 2 years ago. I love it so much and would love to have another one to switch out since I use it every day! I LOVE the tweed one - what a great fabric for the cooler months ahead! Either the green or burgundy tweed tote would be my first pick: first, because who doesn't love tweed and second, because I work in a university and every female here lugs around laptop computers in (usually) clunky bags. It'd be great to show off a vegan/sustainable bag at all the meetings I attend. Any laptop bag with great style is always commented on and I'd love to use the opportunity to show off Crystalyn Kae's tote as an example of how style and sustainability can combine to make a quality product! I'd love the emerald green faux leather bag because I am not only vegan but work in environmental media. I often travel to visit recycling facilities, attend green conferences, etc., and looking fabulous + supporting a cruelty-free designer is the perfect way to express my personal and professional views. Thanks for the opportunity! I like the burgundy tote with a close second being the black tweed tote! I'm a classics girl and these two will go with everything and perfect for fall! I like the Laptop bags , especially the Burgundy Velvet Troubadour Tote Bag . I think it suits my character . That NAVY BLUE is DELICIOUS! Love it. Oh la la the Wine/Burgundy Tweed Troubadour Tote Bag rocks! x.
I'm loving that in this bag I can carry my reusable water bottle! My favorites are the solid black and the black tweed Troubladour Totes! I think the tote is actually my favorite, though I love the peek-a-boo patterns in the drawstrings and clutches. The burgundy color is gorgeous! This would make a great laptop bag/purse combo. The number #5 is just awsome ! What a vivid shade of blue. I love the green one as it reminds me of nature and since my closeth is full of brown/green and black clothes it would probably fit best. I like the wine-coloured tweed one. It stands out from the crowd with an interesting fabric. I've had my eye on the beautiful navy blue tote for awhile. It will come in handy when I head back to school! The Soiree is my favorite but I have a brown Troubador and LOVE it, so maybe I'd get the same style that I have but in black. West coast created, made-for-my MacBook tote and oh, by the way, no animals were harmed! Yes, please! Love love--especially the perfect plum! Thank you! I love the dark blue one. It's such an elegant color in a very beautifully design bag! Love the gray troubadour. Classy and functional. The Burgundy with Ocean Poppy Soiree bag is my all time favorite! I would like to get Burgundy Victorian Roses M�tier Tote for my Mom. My daughter loves the color blue, so the tote in navy would be a natural choice. She carries a lot of "essentials" so a big bag is a must! It would make the perfect gift. I love the Cobalt Blue Tweed Troubadour Tote Bag! It's fun fashionable and it's my favorite color! Love the Grey one with matte finish.. simple and chic.. it would go with ANYTHING!! not to mention the size is just right to fit all my bits n pieces in there..
Gray M�tier Tote would travel with me EVERYWHERE!! The Burgundy Tweed Troubadour tote is pretty great! I have a Burgandy Charleston Large Hobo that was custom designed for me with a blue interior and blue stiching. But I would love to have the tan troubador as my current bag does not fit a laptop. It's b/t the Tweed Troubadours & the Baby Bag Soir�e for me. I'm loving the mix of two materials on both styles. These look top notch! Ah I love them all - but if I must choose, then I'd have to go with the Black Tweed Troubadour Tote Bag! The Orange Troubador is hot - the colour would accent dark colours nicely and stand out in the dull winters we have here in Ottawa. It also reminds me of the colours of our NDP party - whose leader, Jack Layton, died yesterday. I LOVE the Wine colored Troubadour! It has everything I need for a laptop carry bag I have been looking for all this time. AND it is ecofriendly to boot! *woohoooooo* Since I advocate an ecofriendly lifestyle through my business The Orange Owl (www.theorangeowlshop.com) I have been consciously trying to set a good example myself! I am now subscribed and liked on FB. I'd like to win the Blue troubadour tote! Thanks! I love the Green Troubadour Tote Bag - I definitely need a new one, and I am very picky about my bags! I love the Troubadour in black. It looks like the perfect bag for travel. Also, Crystalyn was adorable in person at the Urban Craft Uprisin in Seattle where I picked up a tweed Matinee Messenger - love it! Black is timeless and classic. I subscribe via email. I also like the Burgundy Monarch Hobo Bag - thanks for the chance to win. I adore the Brown Tweed Tote Bag - beautiful. I love the grey troubadour tote - it's chic, professional, and perfect for fitting and organizing everything you need! Love black. And vegan style is sooo chic. These bags are so delicious! The green back is my fav, the perfect color to show off my new vegan bag! Pick me, pick me! Any of the Troubadours would be lovely to carry my laptop to the office! I love the burgundy tweed. Classic, beautiful, eco-friendly. What more can a girl ask for. I want it!! The black tweed is so me, but the Metier tote is equally me. the Troubadour totes are incredible-love the varied pockets- I normally go for black because I always wear it, but the burgundy and the green are beautiful too. I like the Metier because it seems simple. I like how it looks, but I like the ease of the snap pocket and zipper on the outside. The purple one is sharp. Looks pretty rock & roll. I love the Troubadour bag with the varied pockets-they are sooo useful-black is usually my pick,but the burgundy and green are beautiful also. Fabulously handsome-looking laptop bags! I have been using the same laptop bag for more than three years! It's time to replace. I hope I can get the blue one! The black troubadour will of course go with anything and create style envy with any outfit. But I have to say I am loving the burgundy - I can imagine it during fall travels to Paris causing more then one head to turn in admiration. And of course who doesn't live that these bags are vegan! 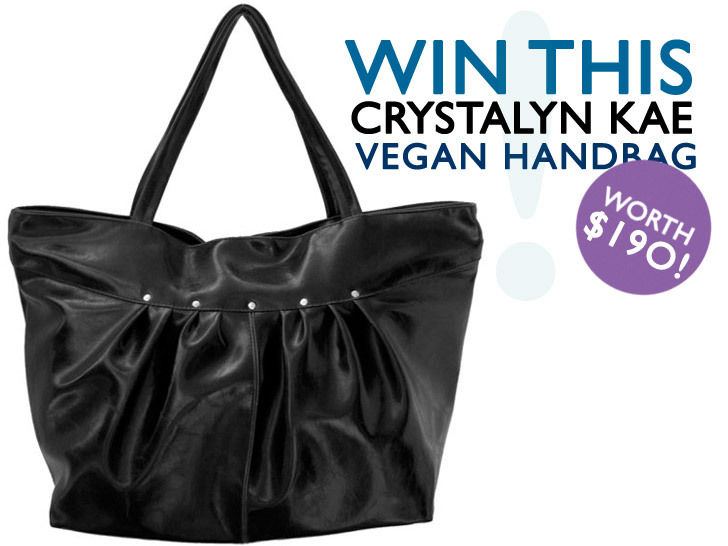 Crystalyn Kae makes beautiful high quality bags so really any one of them would be a treat to own! My favorite Troubadour Tote Bag style is the black tweed, and I absolutely love the orange Metier Tote! All the colors of this laptop tote are great, but the blue and dark green are my favorites. Both fun and practical for work and school! Troubadour in green is my favorite! These are all lovely, roomy,but not huge, stylish, but simple and suitable and also functional, the brown or burgundy tweed Trobadour are so perfect to carry all I need with me. I�d use it for ages !! The Troubadour in cobalt Tweed is gorgeous! And its size makes it practical for a student like me. I think they put the best one on this page for their giveaway. I would like the Brown Troubadour Tote Bag. It is really cute and stylish. I am in love with the black or Burgandy bag!!! As someone that is out and about all day, and well into the night usually,I tend to carry a lot around with me so like the larger bags. Totally love the look of the Troubadour tote! Stylish and practical, can carry my laptop?! - right on!. Love the tweed! I really do love the Troubadour. The tweeds are cute, but my practical side likes the black glazed fabric. Looks easy to wipe clean, and classic! The purple puckers and silver embellishments are so very pretty, so the burgundy monarch hobo bag is my favorite. A lot of people must feel the same way since it's sold out! I'm also partial to the green troubadour bag since I wear a lot of green, it's one of my university colors, and the inner lining is such a light, cheery hue! The things I need always seem to wriggle down to the deep, dark bottoms of bags. Love the Burgundy Velvet Troubadour Tote! Thanks so much for the giveaway! Loving the brown troubadour tote bag... perfect in every way! It would be great for work and all of my urban adventures. Love the design! This bag is more than just a statement; it is beautifully made. The subtle pleats with studs are a great accent with the faux. The tweed laptop bag is gorgeous and also my favorite because it plays with different textures. The colors that she is using the for fall will aid anyone in making a fashion statement with their fall wardrobe. Plum and emerald are beautiful and perfect for fall. I also love the multiple pockets because I am an organization freak and need a space for all my stuff. Choosing one, it is hard to do, but the plum tweed laptop bag would be perfect for me, not only because none of my bags fit my mac, but it would be a storyteller for my environmentalist mind! I love the Burgundy Tweed Troubadour Tote Bag, they are all so cute and special! I can fit so much in them. I'd love the Ale Brown Soir�e Brown with Ocean Poppy...just a hint of happy color peeking through and large enough to carry everything I own. This would be my everyday awesome bag. The bags are all so beautiful! I like the Metier for it's clean lines but am impressed with the interior of the Troubadour (red twee just pops!). Beautiful!! I love the fact that this bag is stylish yet animal friendly! 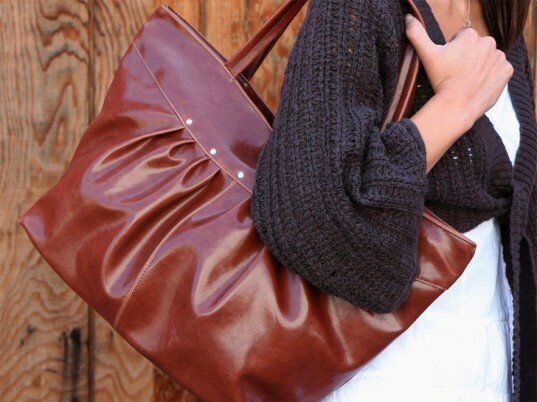 The Troubadour tote is a perfect Fall addition to your eco-conscious wardrobe! I like the Brown Troubadour or the Burgundy Velvet Troubadour. The brown one is so classic, and would go with anything, but if I had to pick a second choice, the pattern in the velvet is gorgeous. The burgundy tweed Troubadour Tote is just perfect! Fashionable, animal friendly, and completely functional. I love the animal friendly, vegan bags! My favorite is the Matinee Messenger Bag, but I can't decide on a favorite color. i just love that last tweed bag. classic style, goes with pretty much anything. very useful and practical giveaway! I would love to rock the Black Tweed in the fall/winter. It's classic, chic, and definitely original in a vegan tote state. It's a perfect size for people who have larger laptops like my throwback Lenovo. I also love the protection at the bottom, which comes in handy with the heavy usage I plan to get out of it. I'm loving the Troubadour bag in plum (#3)! It's the perfect color for fall, and as an interior design student specializing in eco-friendly, "green" design, I know I'll have it full of design supplies in no time! Style + function is what good design is all about! I love the Burgundy Tweed Troubadour Tote Bag. Its perfectly organized and the ideal color for the fall. Fashion, function all in one without sacrificing style! Luvin the Orange Troubadour and Metier! The burgundy tweed bag is absolutely gorgeous! I love the green troubadour tote!!!!!!!! I gravitate towards all things green - color and materials! Love the Troubador in all of the tweed colors and the velvet. This would be such an upgrade from my diaper bag! Brown Tweed Troubadour would be perfect for all the conferences I need to carry my laptop around in for work...sleek and classy. I would LOVE the burgundy (purple) Troubador! I turned 50 this year and travel a lot with my coveted Apple computer and am the founder of ecoartspace, a platform for artists addressing environmental issues. I would be an proud to carry your bag as a gift and would spread the word for you. I love them all! especially the last photo, the one that looks woven. would love to have one! The grey and burgundy Troubadour Totes are both gorgeous! Definitely classy! I would love to own the tan troubadour. Have bag and laptop will travel to and fro work and school. I love the plum troubadour, gorgeous! It's hard to choose! Burgundy or brown. This bag is absolutely gorgeous. As a strong opponent to leather and other animal-derived materials for fashion, this bag would help me make a statement. My current faux leather bag is basically falling apart from the daily use (it's my work bag) and this one looks like it would make a nice replacement. I would be so so so happy if I got the brown troubadour! Thanks! The Burgundy Tweed Troubadour Tote is so beautiful. I love fall colors and the mix of texture is very fun. The deep burgundy tweed bag for the win! A nice classic style and yet designed to hold everything I need safely and securely. Everything I love in a bag, attractive and effective. I like the Burgundy Troubadour Tote Bag. The tote itself is classically style with a nice touch of silver. The color of burgundy adds a unique-but-subtle touch to any wardrobe. In addition to being vegan, it's also styled to organize to boot: pretty, function, and ecological. Who can beat that? Absolutely love the bergundy tote. My favourite colour of all time! and such a simple beautiful style. The Navy Blue Troubadour Tote Bag is easily my favorite! This would make my beautiful wife look even better! I especially like the dark brown leather bag #3 on the slideshow.. Very sophisticated..
Great blue with no hardware! The Soiree Drawstring tote is definitely my favorite! The Geisha blue instantly caught my eye! Such a rich color. This bag would definitely take me from my day job right to the pub at night! I love the "Soir�e drawstring bucket bag" design the best. Crystalyn uses vintage fabric in the pleats. That peek-a-boo of color and drawstring really makes this bag stand out. I totaly love the black one because it combines with all kinds of cloths because black goes with every color! I like the burgundy tweed Troubadour tote. I adore this bag! Especially the green one - so earthy and classy! I love the black bag! Its so classy & chic. Being a business woman doesnt mean you have to hual around a bulky old fashion laptop bag! I love that these bags are made from natural materials. I love the Gray Troubadour Tote Bag. It is roomie enough to hold everything I have for school. Hard to choose, Ill go with the Burgundy Tweed Troubadour Tote Bag. Vegan Tweed is the BEST! I like the Monarch Hobo because it look professional enough for work. I Love all of the totes!! You said it best, the "Troubadour Tote Bag is a rock star"....As a Mom, rockstar has a completely different meaning, and this bag fits my needs perfectly! I love the "Cobalt Blue Tweed - Liberty 'Wilshire'" because it's classic, cute, and I could wear it with anything. Hi, good luck to everyone!!!! :) I like the burgundy with fabric and red inside. I like it more of fabric, they las longer. Orange Troubadour Tote Bag is my favourite, orange is so shiny . I would get this kind of bag for work and to play. I love the reddish brown Troubadour tote. It has the warmth and relaxed look that I love. I heart big totes! Love any of the brown numbers. Hope I win! It may be back-to-school season, but you won't need any instruction on standing out from the pack. Take your A-game up a notch, whether you're hitting the lockers or cubicles, with one of Crystalyn Kae's capacious Troubadour totes, which we're giving away in your choice of available solids, velvets, and tweeds. Punctuated by silver-toned hardware, each bag is handmade in Seattle from glazed cotton, which Kokorowski crinkles, stretches, and buffs to give it a supple, leather-like appearance. Plus, the Troubadour includes a padded divider�roomy enough for a 15-inch laptop, homework, and not-at-all-fake doctor's notes. Enter now to win!